Most of you are probably not in the same boat where you are able to freely drop a few 100$ every time that you get zeroed. So, what do you do? Especially in the early game? How do you bring your troop numbers up quickly so you have a solid number of troops to work with? Back when I was playing free to play I had this strategy that I felt work well for me. Even now I still use it occasionally. I was getting ready to migrate to my current kingdom I didn't want to spend the 300ish dollars it would cost to buy migration scrolls. So, I decided that it would be cheaper to rebuild my army in the new kingdom vs paying to migrate and keep my current might. I had about 450k Hospital capacity and I had a little shy of 1.2 million troops a little over 400k t4 and the rest t3. So, I set up some camps and had a friend in another guild attack me and hospitalize all my T4s. I then had fun with it and went next to a guy with 500m might and started sending my T3s in waves of 50k at his castle until they all died. Brough myself down to the minimum might needed to migrate with only one scroll. I migrate, YAY! I can heal my troops and start over! But that's not what I did. 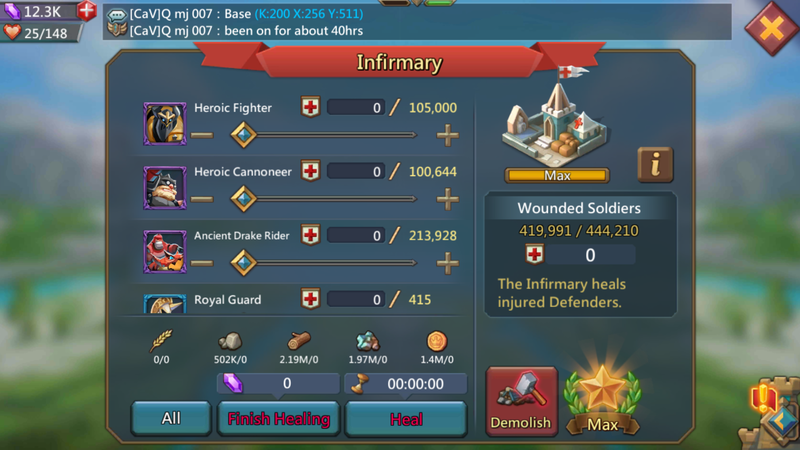 I know a lot of people who are always eager to heal their troops right after they hit the hospital. If you plan to build up your army to maximize your troops I recommend against it. Especially if you don’t pay to play or pay to win. Those troops will be recovered regardless of what’s going on outside your hospitals. I waited to heal them, trained back my T3s and more T4s before I brought them back out of the hospital. I got back to my comfortable 1.2m All was great until one day I was frustrated and went to bed without a shield or hiding my troops even though I have and run the bank for our guild. I had just finished annoying the ruling Chinese guild in our kingdom, they sent all my troops back to the hospital and killed the rest. I feel like I must mention that this is a recovery method for troops, not necessarily a way to train them. This always worked for me during a time of war, my reserves would just nap in the hospital while I was able to rebuild my troop count. The troops in the hospital are hidden nothing can happen to them there. Start worrying about the troops you will have not the ones you already have. You can’t use hospitalized troops, but they are still there in a sense. Start training new troops. You start by hiding in the shelter, and once that fills you swap your sheltered troops out into a garrison and use your shelter as a quick hide for troops that you are training on the spot. It is easier and safer, especially if you have a bank to have a garrison you don’t have to worry about and the shelter open for the troops you are training. Once that fills to capacity you make sure your garrison is full and start working on the reinforcements. So, from this strategy let’s say you have a garrison capacity of 200k troops, you can reinforce 200k troops and your shelter holds 100k. That’s 500k troops there. Oh, and don’t forget that you have let’s say 200k in the hospital. By not healing your troops in the hospital right away you allowed yourself to be able to more strategically hide more troops which in turn means more troops to work with. Here's what I recommend. First focus on hospital capacity, 200k is a nice round number to aim for if you plan to do this but anything above 100k is a solid number. That is usually what I go for when I start a new account. So, if you ever get zeroed during a war, you are guaranteed to bounce back with 200k troops. But instead of healing them you train new troops and hide them as they become available. For myself, I have a 250k garrison capacity, 238k shelter capacity, we all have 200k reinforcement and currently, I have 530k hospital capacity. So, when I get zeroed, 530k troops go to my hospital. If I use this method to recover, I will be able to hide 688k new troops. If I had healed first, that number would only be 158k. Treat the hospital as a second shelter and watch how much easier it is to build up an army more efficiently. The more armies you have the more troops you can hide. As long as you are keeping track of where your troops are and how long they can stay there this can be a valuable technique. Especially as a free to play since it can get expensive to train troops. Good Luck! I hope this helps! Next Next post: How Many Gyms We Need for Training Familiars?